What’s my baby up to this week? According to my favourite pregnancy app ‘Pregnancy+’ my little peanut is now the size of a plum, can bend stretch kick and even make faces and the gender is becoming more and more pronounced. I can’t get enough of sleep at the moment. If I had it my way I’d stay in bed 24 hours a day but unfortunately I don’t have that option having a toddler around. This week has been hit and miss with fatigue some nights I’m exhausted and hit the sack pretty much the same time as I put Max down at 7pm and other nights I can push myself to 10pm. I’m hoping fatigue will be ease because I really do miss spending my evenings curled up on the sofa with Freddie. I’ve also been maximising the opportunity to still sleep on my front, I’m going to miss this ALOT when my bump is big. Because of what happened with my labour and delivery with Max (read his birth story here) this pregnancy needs to be consultant lead. I met with my consultant for the first time this week and we discussed a possible VBAC delivery (vaginal birth after c section) versus opting for a selective c section. I’ll write up a separate blog post on this subject very soon. At the appointment the consultant asked if it was okay to try and find the baby’s heartbeat using one of those doppler machines. So she did and within a second of placing the machine on my belly she found the heartbeat! I could have cried, it was the first time I’d heard my baby’s heartbeat it was so fast and sounded exactly like a galloping racehorse. ENERGY! I’m constantly exhausted throughout the day. 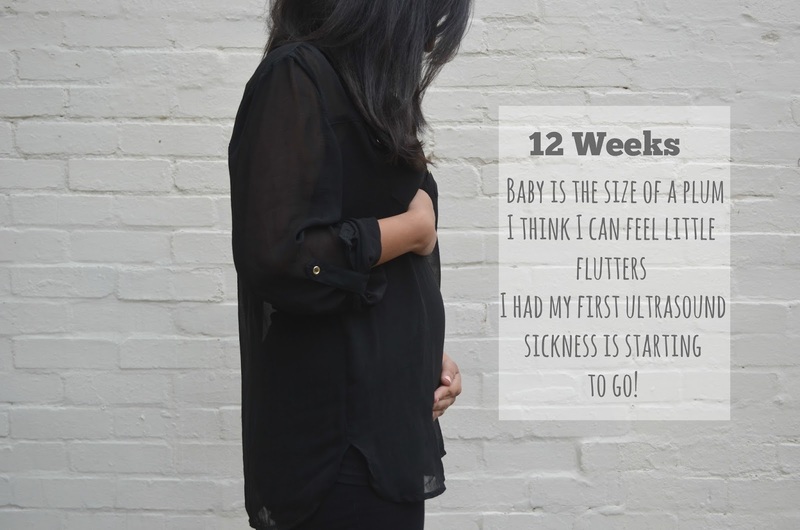 Running around after a toddler whilst pregnant is tough, I’m dreading how I’ll cope during the later stages of pregnancy. Thankfully Max still naps for two hours in the day so I take full opportunity and sleep when he does. This week I went maternity clothes shopping and boy did I need to. My non pregnancy jeans and leggings were really starting to dig into my bump and my tops just didn’t look right. I picked up a pair of leggings and black jeans from H&M which are super comfortable and pull up right over my bump. I also popped into Primark and bought a few jumpers in bigger sizes that will cover my growing bump and I also threw in a pair of Christmas PJ’s because who doesn’t love a pair of Primark Christmas PJ’s?! I can honestly say this week has been the first week I’ve felt little flutters here and there. I asked my midwife if it was too early to be feeling movement and she said with subsequent pregnancies it’s very likely you can feel the baby move as early as 12 weeks. I’m hoping as the weeks progress I’ll feel my little peanut move more and more. Anything with potato! Chips, crisps, roast potatoes and jacket potatoes. I had the exact same craving when pregnant with Max. Not really. I feel like my morning sickness has eased a lot. The only thing that makes me sick is if I haven’t drunk enough water in the day but apart from that I’m quite lucky that sickness has made a sharp exit. Thank god! We’ll be keeping the gender a surprise like we did with Max. The thrill of not knowing was exciting and I will always cherish the moment the midwife screamed ‘it’s a boy!’ Finally finding out the gender after being in labour for 48 hours was the icing on the cake. Bloating! By the end of the day I look around six months pregnant. I had this symptom with Max and it did pass around 16 weeks so I’m hoping it does this time around too. Overall I’ve been feeling great this week. My hair seems to be a lot fuller and I’m shedding a lot less hair. My skin feels and looks amazing and it’s a lot less oily than it used to be. I’ve also noticed I’m not breaking out in spots like I did in the first 8 weeks of pregnancy. Oh the perks of pregnancy! The baby becoming stronger and bigger so I can feel more movement and kicks, best feeling in the world that is. Oh and something non baby related I’m off to Paris for the day on Wednesday. It’s for my mums birthday and I plan on devouring every flavour of macarons from Laduree. Nom nom! Previous Post What’s In Max’s Halloween Basket?